As a shareholder at Kohm & Associates, P.C., Jahannah Augsburger oversees the originations and title departments for the firm. Jahannah has been with the firm since its inception and began her practice ensuring regulatory compliance for the firm’s tax lending clients. She has since expanded her practice to include curative document preparation for complex title issues, risk analysis to help aid client decision making, and commercial loan document generation and review. Jahannah also advises clients on entity formation and corporate compliance issues. Before joining Kohm & Associates, P.C., Jahannah worked for the U.S. Magistrate Judge Nancy Stein Nowak and assisted in reviewing pleadings, motions, and standards of review. Jahannah graduated from the University of New Hampshire with a degree in Business Administration and a minor in Psychology in 2004. 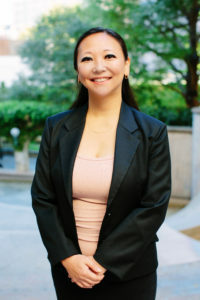 She earned her Doctor of Jurisprudence from St. Mary’s University School of Law in 2010, where she was an Associate Editor of the St. Mary’s Law Journal. Call us to schedule an appointment or email us directly and we will respond to you within 24 hours. Our primary goal is to provide our clients with legal advice and services that are specific to their needs and the needs of their customers. We assist a variety of financial institutions with all of their real estate needs. It is our goal to ensure that our clients receive timely and accurate legal assistance.